Even the most diehard city-dwellers can’t help but appreciate the warm comfort of rustic home décor. There’s something about stone, wood and other natural materials that invokes a sense of sitting around the campfire, sharing stories with family and friends. The good news is anyone can bring that feeling home. Whether it’s one room or the whole house, rustic home décor blends seamlessly into any space. Incorporate a few accents into a fully decorated space or go country crazy. Here are a few ideas to produce that cozy aesthetic into any room. Possibly everyone’s favorite room in the house, rustic kitchen décor only adds to the “come gather ‘round” ambience. One popular option is to incorporate stone or brick into a kitchen island. By experimenting with the size and color of the materials, homeowners can build a mosaic into the island’s base. Stone or brick can also make for a gorgeous rustic kitchen backsplash, bringing together the space’s many design elements. Another option is to trade stone for wood, either using slabs or round cuts from logs. From red-tinged mahogany to dark Brazilian walnut, the range of color options prevents clashing. DIYers will be able to develop these items with little effort. 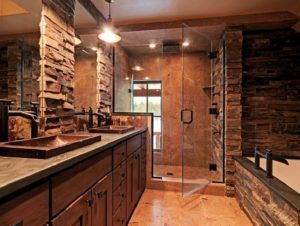 For the less skilled, contractors have become incredibly familiar with the natural look in recent years. 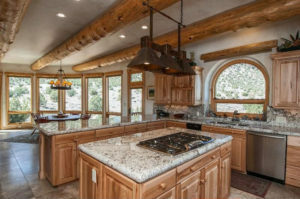 The good news is that even in a modern kitchen with stainless-steel appliances, these rustic kitchen elements fit right in. There’s nothing better than snuggling under a thick comforter on a cool night. 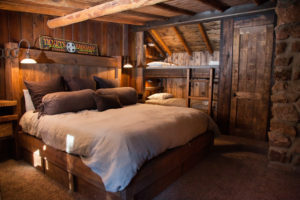 Channel that warmth year-round by bringing rustic accents to the bedroom. A solid wood headboard can give the room a subtle country-style boost, while a single wood plank wall is a bold statement piece. The bedroom is really all about accessories. Small-scale commitments might include covering cold wood floors with a bear skin rug, designing a tree branch jewelry holder or hanging a mirror or picture frame that’s surrounded by small sticks or neutral colored twine. While a wood-burning fireplace is the epitome of rustic home décor, even convenience electric models can take on a log cabin aesthetic with stone framing or a wood mantle. Add mason jar sconces to their side or anywhere you need a little light. Organic materials also make for great coffee tables, and a large stone chest to hold board games, magazines or old records is an easy way to limit the rustic décor. A chandelier made from a tree branch is a more obvious way to bring the outdoors in. Here’s where wood accessories can really shine. Think wood towel racks, toilet paper holders and cabinets. Circular pieces cut from logs can also be applied to the walls as an alternative to a wallpaper border. Even using mason jars to hold candles, cotton balls, toothbrushes and other toiletries can create a subtle impact. Stone flooring inside a walk-in shower complement the freeing look that comes from having frameless shower doors. Going rustic doesn’t have to be a high-level commitment. You can be as folksy as you feel in the moment without trading city life for a cabin in the countryside. Start slow, but don’t be surprised if the increased coziness prompts you to plan a friendly fireside gathering—with s’mores, of course.